Tell me you’re not tempted to laugh. Tell me you don’t find this ludicrously melodramatic. I think it’d be far easier to get into this show if it didn’t try so very very hard. Dear Vampire Fiction: can we not have romances built on a foundation of the vampire wanting to kill and eat the human. I mean, is this is a straight people thing? “Oh my lover may rip out my throat for snack food. Isn’t he dreamy? !” Have a word with yourselves. Anyway he eats the stag and then talks to Hamish on two main topics: One that the book could be super important for demons as well as they’re also having problems with escalating mental health issues - homelessess, suicide etc. The book is needed by everyone. He also references the fact that demons are generally considered 3rd class citizens in “Creature” culture. The other is that Matthew relies on Hamish to be his conscience. And he’s telling Matthew to stay well away from Diana so he doesn’t eat her and then feel all guilty about it. To check she calls Emma her aunt’s partner who confirms he was obsessed with her mother, her parents didn’t trust him and he was super into dark magic as well. Satu the creepy also decides to stalk Diana and start messing in her head. Because everyone here is like super good at building rapport and trust. Gillian keeps trying to push Diana towards Knoxx but her own dismissal of genocide doesn’t especially thrill Diana, especially since Gillian backs it up with clear loathing of vampires without every speaking to one: which makes Matthew way more tolerant of witches than witches seem to be of him which strikes a bit of a chord for Diana. Even if she does still insist she wants a normal life. She does wonder how Knoxx is learning so much about her… when she catches him at Gillian’s house and naturally feels very very betrayed by this. Knox continues to try to press her, Ambushing her at a party to convince her that genocide is totally ok; when she walks away from him he starts mentally messing with her - causing headaches and intimidation with telepathy. Until she cracks and lashes back at him to stay out of her head - breaking the window and staggering him at the same time. 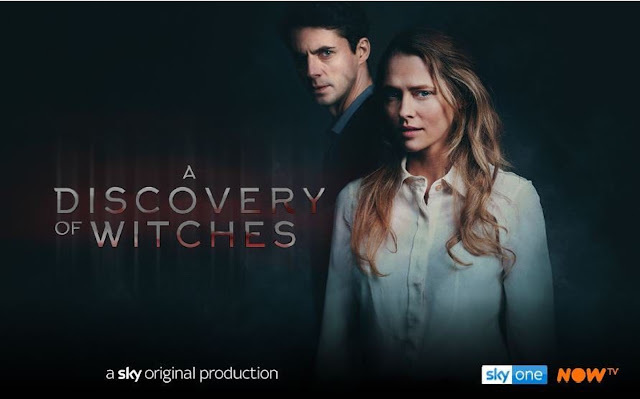 This begins another element from the Witches - both Satu and Knoxx realise Diana is powerful and special and not just randomly able to summon the magic book. From here she turns to the only person she can trust. Matthew - the vampire who she had to carefully back away from so he didn’t rip out her throat. Diana does not make the best decisions. He takes her to his lab, introduces her to Dr. Miriam Shepherd who runs the lab (and isn’t a Diana fan but I think she’s at least less overtly genocidal than Knoxx) and Dr. Marcus who is charming in that oily-trying too hard thing. Matthew shows his evidence to Diana that their species are drying out - including witches who are becoming weaker and less magical with every generation (which is explained by technology being used less and as witches used magic less it was less prevalent in their DNA… which I guess would work in terms of less magical people would have more chance to succeed but it all feels… a little scientifically dubious). And yes, the book is key to fixing all of this. And he makes a point about it being important for witches to use their power. She considers this but she thinks that they have time to decide - after all, no-one is going extinct tomorrow. Matthew disagrees and he has a very different view of time. His longevity means that potential extinction isn’t some distant menace - but a very present threat to him. Thoroughly convinced Diana tells him all she knows about the book. To which he kisses her wrist which seems… so… very...not wise. I’m still not loving these characters. The trope of the male vampire being unable to resist eating a woman is annoying. His deciding it’s totally ok to kiss her wrist for no apparent reason despite this Craving is just bizarre. And Diana still really doesn’t have a reasonable motive for ignoring her basic magic. But I think a lot of it would be better if the show wasn’t trying so hard with the drama and theme and if we didn’t have some really slow pacing caused by it: before turning to Matthew we actually have a recap of pretty much all of Diana’s experiences with the witches and vampires. This is the second episodes. We don’t need a recap montage!